A retinal tear can cause a retinal detachment and is sometimes an eye emergency. Retinal detachments can lead to permanent vision loss or even blindness. 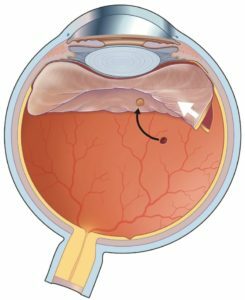 As a normal aging change, the vitreous gel sometimes separates from the back of the eye (this is called a posterior vitreous detachment or a PVD). In some cases, it can pull so hard in areas of firm attachment, causing a retinal tear. A posterior vitreous detachment is the most common cause of a retinal tear. The most common symptoms of retinal tears are flashes and floaters when caused by a PVD. Sometimes patients experience no symptoms at all. Once in a while, the retina tears through a blood vessel, causing bleeding into the vitreous (called a vitreous hemorrhage). A vitreous hemorrhage can be frightening as it can quickly decrease your vision. Fortunately, loss of vision from just a vitreous hemorrhage is not permanent. Regardless, it is recommended that any new flashes or floaters or frank decrease in your vision should be examined by your retinal specialist or your eye doctor. Although most tears result from a PVD, other less common causes include high myopia (near-sightedness), lattice degeneration (a condition which causes thinning of the retina) and eye injuries. In my experience, severe blunt trauma does not cause retinal tears as often as you would think. Previous cataract surgery is a big risk factor for developing retinal detachment. Is Retinal Tear An Emergency? Yes, and if not treated, retinal tears can lead to a retinal detachment and vision loss. I recommend to my patients and my referring doctors that anyone with symptoms of retinal detachment or PVD get a complete dilated examination. This is the best way to ensure that you do not have retinal tear or retinal detachment. As a retina specialist, I prefer to use a special retinal laser to treat the retinal tear (“spot-welding”). Most of the time, the laser procedure is done comfortably in my office or in an outpatient surgery center. Some retinal tears cannot be treated by laser (for example, if there is a vitreous hemorrhage). In those cases, I use a cryo machine to freeze the retinal tear. If you have a retinal tear in one eye, there is a 10% chance that the other eye will develop a retinal tear in the future. If you have flashes or floaters, or if you recently had a PVD, and if you live in the Orange County area, feel free to give us a call at 949-427-2020.